We do not consider reading the handouts a substitute for attending a workshop where you can see and hear all of the details of this subject. In addition, being able to clarify any questions you have about the materials provided can be very important in making sure the work is done properly and that the results will be rewarding. We intend to conduct future workshops to meet the demand. Please let us know if you are interested. It spreads mostly by rhizomes rather than seed. Controlling Phragmites requires killing the existing root system. Cutting and/or burning Phragmites - Does that work to control it? Not when it is the only thing you are doing. In general, there is little change to the health of a stand of Phragmites due to cutting or burning. In some cases it may actually encourage growth. Small standalone patches may be controlled by constant cutting over a period of many years. If the stand being cut is adjacent to an uncut stand, the area being cut will continue to grow by getting its energy from the adjacent root system. Cutting and or burning can be an important component in the control of phragmites when done as part of a chemical treatment program. That is because cutting or burning allows better access to this year's growth, which is the only part that will move the chemicals to the roots. Also, cutting or burning will make the current year's growth shorter and will allow better human access for applying the chemicals. Burning will encourage the return of native plants. Should I try pulling it out? No. That will break the roots into many pieces, each of which will grow into more Phragmites. The only known method of control is a multi-year treatment with herbicide. The best control is achieved when herbicide is used as part of a long term plan which includes cutting and/or burning. The cutting or burning helps reduce the dead stands of material so the chemicals can reach this year's green leaves and stems. However, don't cut or burn within the eight weeks prior to herbicide treatment. Burning as opposed to cutting has the additional benefit of exposing the soil to encourage competing plant germination from the seed bank in the soil. Make sure you know that what you are treating is actually Phragmites. Also, there are some native varieties of Phragmites which should be protected. It is our understanding that no native species of phragmites have been found in South East Michigan in recent history. If you find out otherwise please let us know. What herbicides can we use to control Phragmites? rIn Michigan, if you want to kill phragmites on dry land above the ordinary high water mark, on your own property, with chemicals you can buy at any garden store, you can use RoundUp or a similar Glyphosate based product. Spray it on the leaves and stems sometime from mid-August through the end of September. Follow all instructions on the label. There are other herbicides, such as Imazapyr (Habitat), which can be sprayed on Phragmites earlier in the summer and may have a slightly better control rate; however, these products are usually too expensive for the average homeowner. Government agencies are the primary users of these expensive products for Phragmites control. If you spray plants which are in the water or growing from ground which is below the "ordinary high water mark" (OHWM), you may need a permit from the MDEQ. See our other web page on the subject of permits at http://www.stewartfarm.org/phragmites/permits.php for details. Also, if you spray plants which are in the water or growing from ground which is below the "ordinary high water mark" (OHWM), do NOT use RoundUp or other products you buy off the garden store shelf, unless you can find a store which sells the herbicides and surfactants approved by the MDEQ for use to control aquatic plants. I have not found those products in local garden stores. One problem is that the products approved by the DEQ are usually only available as concentrates in minimum quantities of one gallon or many times two and a half gallons. However, there is one big advantage to mixing your own chemicals from concentrate. You can make it for a lot less than RoundUp. RoundUp costs about $12-14 per gallon. I mix up a similar product from concentrates for about $3 per gallon. It is a mix of Glyphosate (Aqua Star, AquaPro, GlyPro or Rodeo) and a surfactant (Cygnet Plus). Both are approved for spraying over and near water. These are of course alright for spraying over dry ground too. These products are available on the internet or by mail order from a variety of chemical suppliers. See our webpage on Herbicides and Surfactants (http://www.stewartfarm.org/phragmites/herbicides.php) for details on these products and an explanation of surfactants. Do I have to be certified to use Glophosate or to mix it with a surfactant? From my discussions with The Michigan Department of Agriculture Pesticide and Plant Management Division individuals can purchase these products and mix and apply them themselves. Aqua Star is a registered pesticide in the State of Michigan and does not exclude use or mixing by noncertified individuals, nor does Cygnet Plus. People can mix these products themselves and they can apply them themselves if in compliance with the label requirements including the use of personal protective equipment and disposal. They can join with friends or neighbors to purchase, mix and apply these for each other as long as it is not for commercial purposes and not in the course of employment. When sharing with friends it might be a good idea to have mutual waivers to protect all parties involved from liability due to property damage or chemical exposure of any individual. Though the right to use these chemicals without a license applies to individuals and a group of friends it may not apply to organizations, such as a community group or homeowners association. Therefore, it appears to be better to informally share the cost and labor with friends rather than to create a formal group for this purpose. In Michigan, if you choose to hire a company to do the treatments and they are going to spray near water, they should have a Pesticide Application Business License with a Category 5 (Aquatic Pest Management) classification and the person who does the work needs to be a Certified Commercial Pesticide Applicator whose certification includes Category 5. A list of Certified Commercial Pesticide Applicators is available online at http://www.mda.state.mi.us/pest/ You can also call the MDA at 517-373-1087 for assistance. Whether you are spraying right from the bottle or mixing up the products yourself, follow all instructions on the labels, use proper procedures and all recommended safety equipment. The treatment method you use will depend on various factors. What is the density of the stand of Phragmites? What access do you have to the Phragmites? Are the plants in water? Are there other plants in the area which you want to protect? How long can you wait to see it gone? Do you feel comfortable with handling herbicides? Do you want to restore a view of the water or provide access for recreational purposes? Are you concerned about fire safety for your home? In some cases regular cutting alone might serve those purposes. If the Phragmites is in the water, access for cutting may be difficult (except when the water is frozen) and herbicide treatment might be your only option, that is, if you can reach the Phragmites with the herbicide. If you are trying to bring back more native plants and animals, regular cutting would not be desirable and selective herbicide treatment with one winter cutting may be the best option. Decide whether you are trying to get rid of the Phragmites completely, remove some or just keep it from spreading? 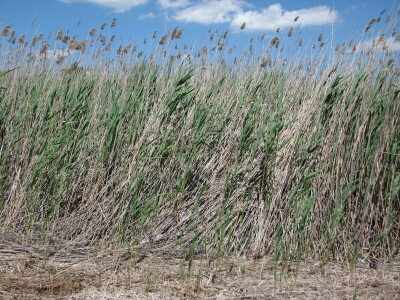 The best long range plan for many homeowners who want to get rid of as much of their Phragmites as possible would include a multi treatment the first year as described above followed by cutting of the Phragmites in winter when the ground is frozen and yearly Glyphosate and surfactant treatment in September. Results will not happen overnight. You should figure you will be working on it in the fall for several years in a row and that you will have to continue to spend a little time each year in general maintenance even after most of the Phragmites is gone. Think of it like dandilions. If you don't keep up on them every year they will come back. Photograph your progress to remind yourself how your work is paying off. Treat the outliers first then work on the main stands. Work with your neighbors if possible. Phragmites does not recognize property lines. You will have more work to control your Phragmites if you neighbors are not controlling theirs.